A leading executive in the global financial technology industry has been named as a judge in the Digital DNA Awards 2019, powered by MCS Group, as the month-end deadline for entry approaches. Tony McManus, the Chief Information Officer, Enterprise Data, at US news, data and analysis giant Bloomberg LLP in New York, will be part of an independent judging panel helping rank entries in the eagerly-awaited Northern Ireland technology awards. He’ll be joined by Victoria Shanks, Executive Director and Global Head of Kx Services at First Derivatives; Lisa Bailie, Eco System Manager at Barclays Eagle Labs; Jeremy Biggerstaff, Managing Director of Flint Studios; Paula Kennedy, Vice President of Concentrix; Dave Vincent, Chief Digital Officer at Tourism NI; Andi Jarvis, Strategy Director at Eximo Marketing and Lisa Donaldson, General Manager at Ormeau Baths. Tony McManus said: “It is hugely exciting for me to be given a chance to sit on the Digital DNA Awards 2019 judging panel, one which consistently unearths some of the best technology talent in Northern Ireland. I can’t wait to see this year’s entries and will be on the lookout for the most innovative ideas and inspiring personalities. Victoria Shanks said: “The Digital DNA Awards are a landmark in the technology calendar and play a central role in highlighting the depth of the sector in Northern Ireland to a wider audience. It is a privilege to be part of the judging panel and I look forward to seeing examples of the innovation, drive and business acumen which have been hallmarks of the competition in the past. 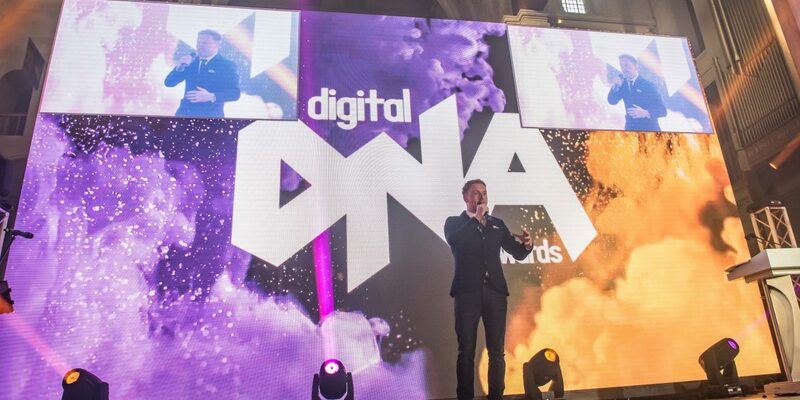 Simon Bailie, CEO of Digital DNA, said: “Having someone of Tony’s stature on the Digital DNA Awards 2019 judging panel, along with the other entrepreneurial heavyweights on the panel, is a testament to the importance of this competition. We pride ourselves on helping shine a light on Northern Ireland’s unrivalled digital and tech community, one which stands tall against the best in the world. Nominations close on Thursday 31 January ahead of the Digital DNA Awards ceremony on 28th March 2019 in St Anne’s Cathedral, Belfast. Shortlisted companies and individuals will receive complementary passes to Digital DNA 2019, taking place 18 and 19 June 2019. Further information is available at digitaldna.org.uk. The full list of categories are: Business Personality of the Year, Developer of the Year, Entrepreneur of the Year, Young Person of the Year, App of the Year, Best Digital Marketing Campaign, Digital Project of the Year, e-Commerce Project of the Year, Best Tech for Good Innovation, Deal of the Year, Best Large Tech Company, Best Small Tech Company and Start-up of the Year.